Does the state you live in impact your closeness to fraud? Yes, it does - and generally for clear and understandable reasons. States that receive a high number of fraudulent packages, for example, tend to be places from which it's easy to send a parcel on somewhere else. So Florida, which is a re-shipping hub, receives a lot of stolen goods, which then get sent on elsewhere. 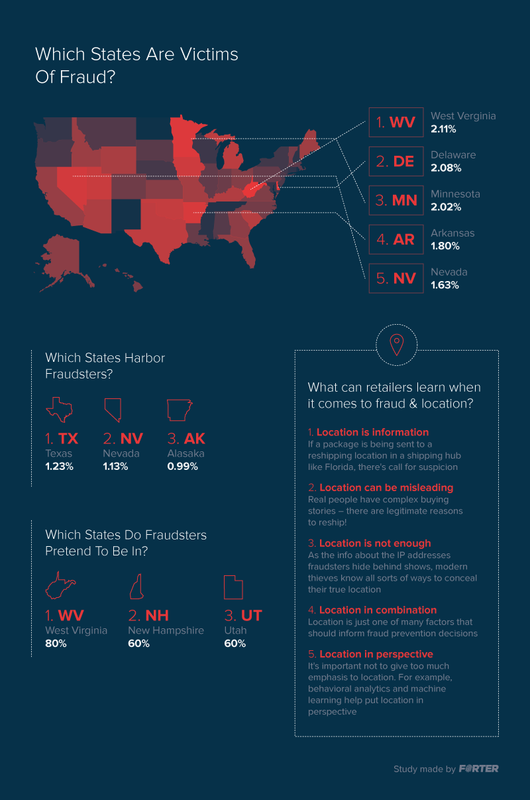 Find out if your state features in these results, and why Texas has so many fraudsters, in this article on Forbes which reflects Forter's research. Merchants can take this kind of information into account when they're making decisions about fraud, but it's important to remember that this is only a tiny part of the whole picture. To make accurate decisions about whether a transaction is fraudulent or not, an enormous number of other factors must also be considered. From showing a match between billing address and shipping address (an AVS match) to showing that the IP address being used corresponds to where the customer's card is from, and more. But there's no silver bullet in fraud prevention, and it's important to remember that customer stories can be complicated: merchants shouldn't reject customers because their buying story doesn't suit a one-size-fits-all template! The key with getting the most out of data of this kind is to view it in perspective. It's interesting, and it can be useful. But it should be seen in the context in which it appears, which means also taking into account all the other information there is about that specific transaction, the individual's transaction history, how things work on that particular website, and an understanding of e-commerce more generally. That's why Forter uses triple-layered technology: elastic identity; cyber intelligence; and behavioral analysis. All this is combined with the power of machine learning and human expertise which constantly refines the system. Not that this makes us any less appreciative of any single factor! If anything, it's the opposite - location and other factors like it are even more fascinating when you can understand their limitations as well as their strengths.